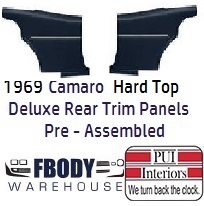 This is a pair of new replacement deluxe rear interior trim panels for use on 1968 - 1969 Camaro with DELUXE interior and HARD TOP models only. These are PRE Assembled Units. Out of the box and onto the car! 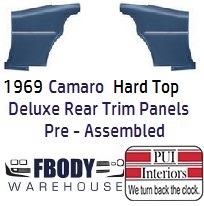 Replacing these units is a snap at home and really improves the look and value of your 1968 - 1969 Camaro!